Several companies announced new flexible OLED panels at SID 2013. None of the panels were demonstrated (except for Toshiba which showed the OLED but it was not powered). First up is Toshiba, which showed a 10.2" 1920x1200 (223 PPI) panel. Toshiba's OLED has an Oxide TFT backplane and uses the WRGB (white OLED with color filters) architecture. 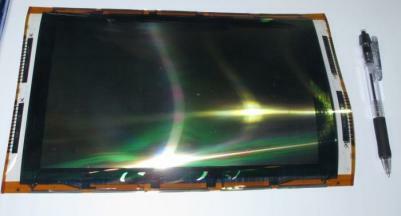 Panasonic developed a 4" flexible OLED with 224x224 resolution (only 80 PPI, direct emission). Panasonic used PEN as a substrate and the panel can be bent up to a curvature radius of 10 mm. This is also an Oxide-TFT panel. To produce it, Panasonic attached the PEN sheet to a glass substrate, deposited the OLED materials and then de-laminated the glass. Finally, Arizona State Universities' Flexible Display Center unveiled a 14.7" flexible OLED. Again, they use oxide-TFT as the backplane. The resolution is only 960x720 (81 PPI). This is a direct-emission panel, which also uses a PEN substrate.